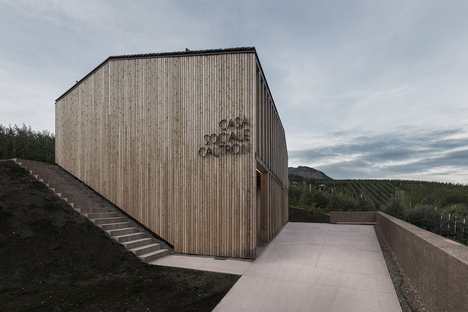 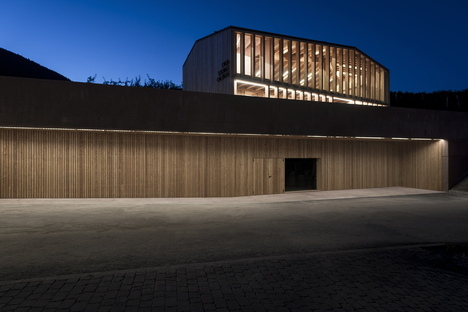 The award for “Young talent in Italian architecture 2016” goes to Mirko Franzoso, from Trentino, who built a new community centre in the village of Caltron, in the municipality of Cles. 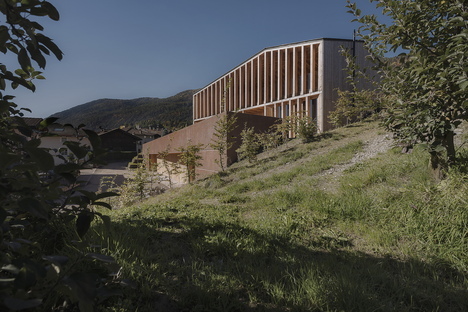 Geographic and sentimental vicinity is the key to understanding the architectural spontaneity of Franzoso’s most recent and most characteristic project. 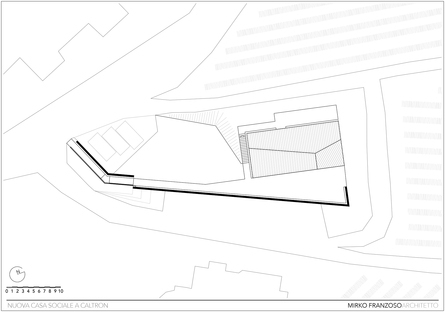 The project was not a direct commission; Mirko Franzoso won a competition on invitation held by the Municipality of Cles open to architects under 35 for the design of a public space to represent the community’s identity. 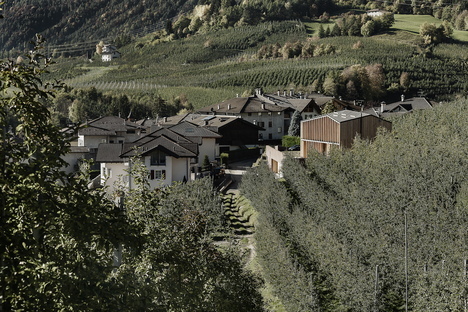 Alpine villages still have a strong interest in place and tradition which is civic as well as cultural, but often have no specific place celebrating this tie, or are relegated to old buildings which are not really suitable for hosting visitors and are identified with a past that is best left behind. 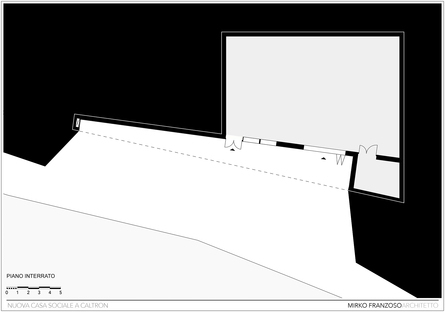 The key to Mirko Franzoso’s work may be found in the ability to reconcile the elements that define the identity of the world-famous landscape of Trentino and the Val di Non, with its gentle slopes on high plateaus, apple orchards and villages with gabled roofs, with the needs of today’s communities, demanding large, airy, comfortable and flexible spaces in which to get together. 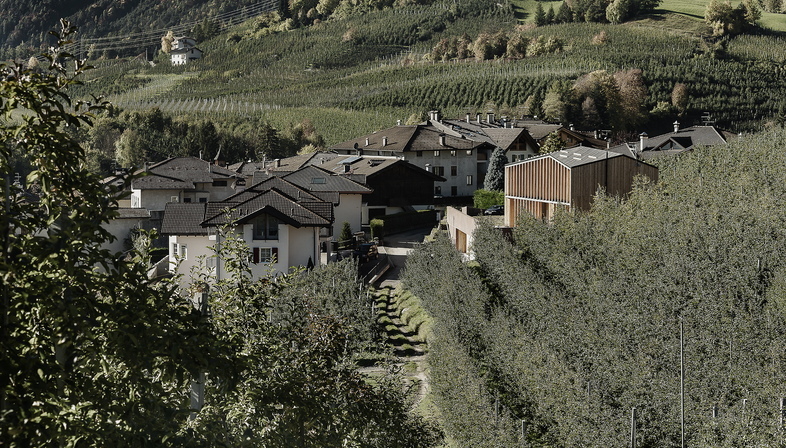 The buildings’ position is strategic, where the village ends and the apple orchards, paths and greenery that surround it begin. 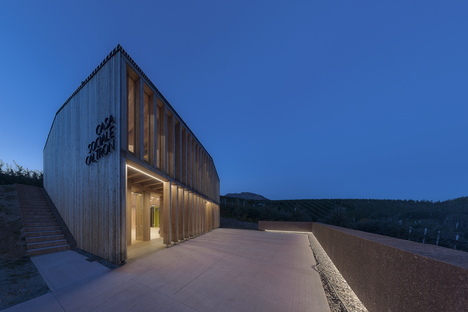 The community centre acts as a bridge, declaring the essential relationship between human history and the landscape, between the natural and the man-made. 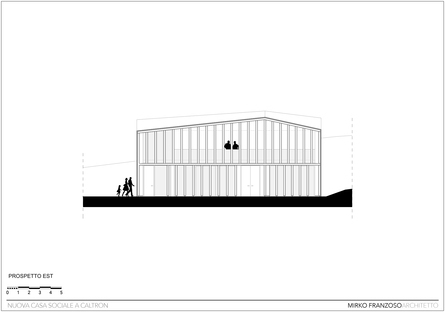 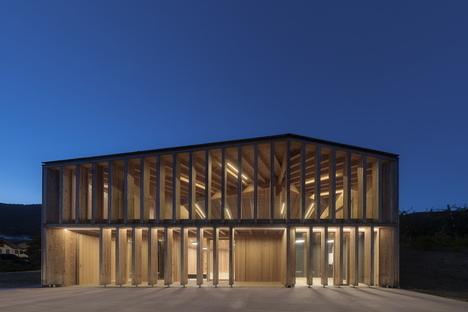 The frame of the community centre is, of course, made of timber. 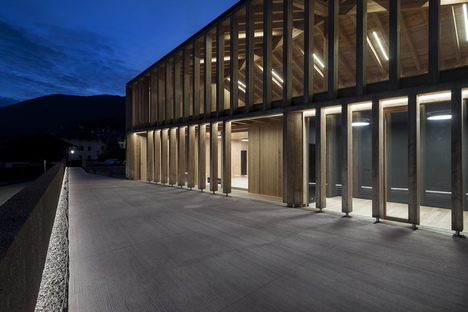 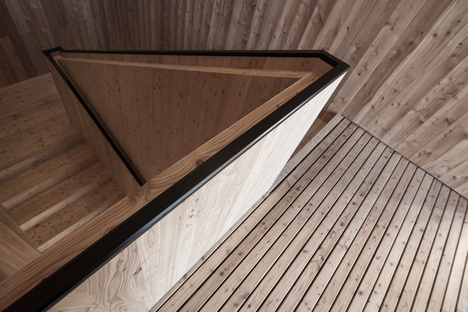 But not local timber, points out Mirko Franzoso; it is larch wood from Austria, left untreated so that it will darken over the years until it turns black and blends in with the older structures in the village and with the colour of the earth. 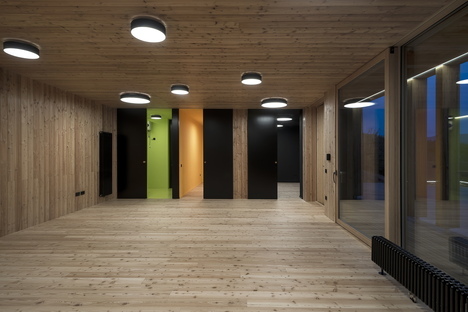 Larch wood is used to build a monolithic building with a traditional gabled roof, which is however not heavily emphasised, demonstrating the architect’s awareness of today’s international architectural idiom. 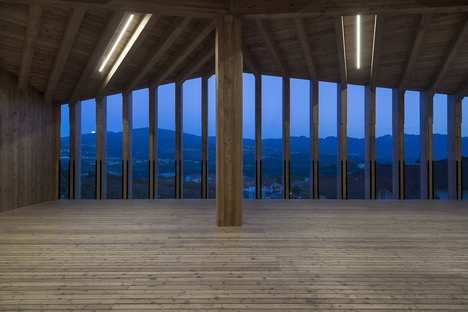 The addition of glass in the clear walls of the ground floor and first floor, with views of the valley to the east, is another sign of modernity, added to ensure that the building is not just a shelter from the harsh local climate but also a viewpoint and a place for welcoming visitors, reaching out towards the landscape, people and the world. 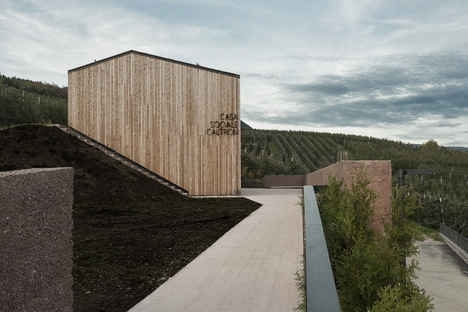 The compact wood and glass block stands on a washed concrete base with walls covered in porphyry following the shape of the land. 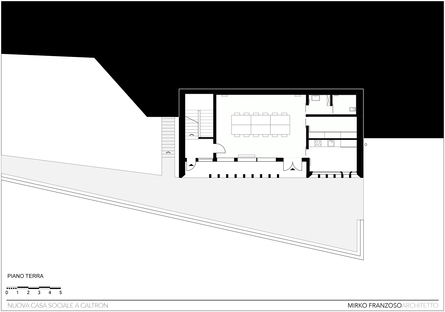 The building has three levels, including a basement, and each level has direct access. At the main entrance to the east, the initial surface of pillars and wooden cladding gives way to a glass skin, creating a protective gap in between. 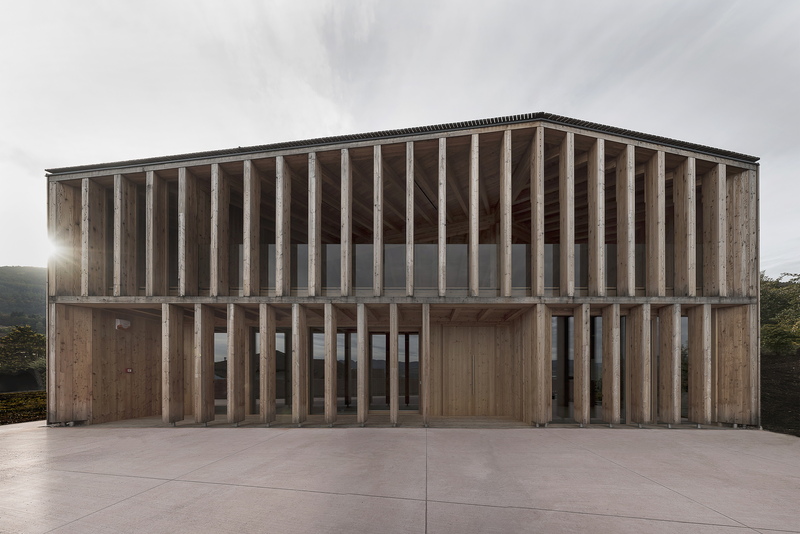 Thus the rhythm of the main façade is marked by the series of pillars, acting as sunbreaks, followed by that of the indoor frames, lightening the impact of the wooden box that the building appears to be on its other three sides: a key compositional element in view of the town’s traditional association with wood. 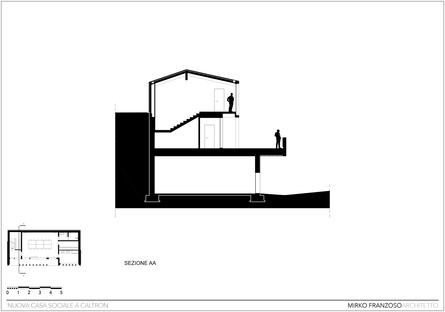 The interior layout reflects the specific requests of the Municipality of Cles. 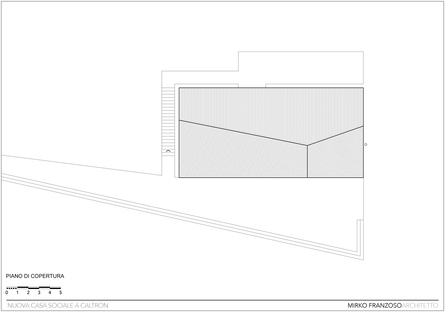 Two large space on the ground floor and the first floor are used to host public events of cultural interest. 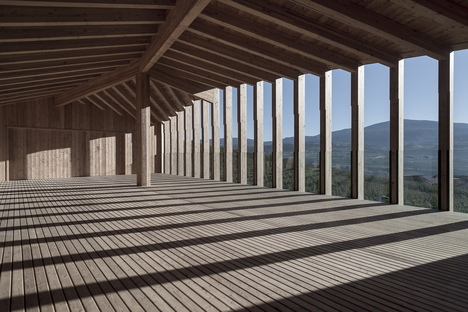 The top floor, with its gabled roof and central pillar, is completely open, and as it is only slightly higher than the rooftops of Caltron, it offers an unusual perspective over the landscape of the Val di Non.